Anyway, I have also illustrated how you could count the waves from the significant low posted by the DAX index in March 2009. At the very least you would have gained some insight at how the waves tie in with each other. Look at the charts in the same order as posted. Very interesting to see your analysis of SPX and DAX. You have the SPX as an impulsive 5 wave move from 2009 followed by a correction in progress, while DAX as a corrective move from 2009 followed by start of an impulsive 1-2 move down in progress. See attached chart http://i.imgur.com/TuRfs.png . Both indices are very highly correlated since 2008. How come two different views? Thank you for your response. I’m trying to learn from your wisdom. I’ve been successful in convincing my wife that we should move to cash in our retirement portfolio. Make a decision when S&P nears 1000 to decide if we want to go long again or wait longer for the dooms day scenario as indicated in the DAX chart. Let me ask you this, did you see any thing in dax which you don’t see in s&p500, or the dax count could be an alternative count for s&p 500 as well? 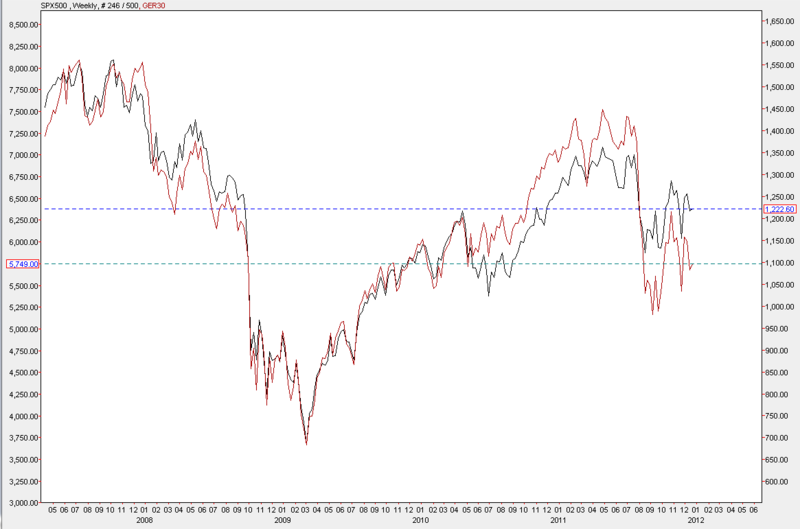 it’s not just spx and dax, but lot of world indexs are correlated some are more and some are less. Just wondering to figure out what the nifty is going to do? I appreciate your posts and comments and I find your book is very educational to every one, who wants to participate in stock market. Hi Sriman, tks for your comments. I’ m looking at the two indices separately. Overall, in the big pic I sm bearish for the SNP as well. I enjoyed the detailed charts, I could question myself on the charts and found answers in comments of the charts. if we look at min&max prices wave iv comes to price zone of wave i in wave 5. Does this brake Elliot rules or should we consider always close prices? Nobody could have explained the analysis better ramki ji. Sir DAX moving well above 6500. Any change in view ? Hi Riddhi, The discussion on Dax earlier was a doomsday scenario, and I thought i made it quite clear that it was still a changing picture. Anyway, if we get a move below 6160 now, that is a confirmation that we will go a good way lower. Best. Hi amazing and educational blog which i have been reading from near inception, but for the first time i commenting! Sir now the dax has far exceeded your expectations do you still expect a significant correction, a small correction has already started with the dax falling from 7200 level to just today below 6900 is this in your opinion a sign of things to come? I feel we may have a sizeable correction coming on the s&p to the 1100 level which is inline with your thoughts this would equate to circa 5500 dax?? Hello D.S.S, I have posted on DAX today. Good luck. I’m new to your blog, so first I would like to thank you for sharing your work. I’m experiencing difficulties to understand your labeling; could you please assist me with this? For example at a chart above (http://www.wavetimes.com/wp-content/uploads/2011/12/Dax-d-19-Dec-2011.jpg) you use a green ABCX formation, then a red ABC follows… and finally an orange 1??? Thank you very much in advance, D.
Hi Dimitrious, welcome to the club. If you are new to Elliott waves it might be a good idea to first read a good book about it. A lot of people think that “Five waves to financial freedom” is a good starting point. About my own counts, the orange wave 1 that came after the second ABC could actually be wave A, but my approach to counting is to be practical and not academic. I am flexible about changing the label to “a” later on. Hope this clarifies. have you chanched your count on the DAX or do you still come up more or less with the same conclusion? would be nice if you could give us another updated chart.